The Ecoeler USB Charger/Tamper-Resistant Duplex Receptacle offers 2 high-powered USB Ports with 3.1 Amp of charging power Tamper-Resistant Receptacles. It has the capability to charge 2-USB powered electronic devices utilizing its 2-USB Ports, leaving the 2 tamper-Resistant Receptacles free for other uses. The Ecoeler USB charger/tamper-resistant duplex receptacle is designed to charge tablets, smart and mobile phones, gaming devices, e-readers, digital cameras and a host of other electronic devices. Perfect for use in residential applications such as kitchens, bedrooms and home offices and in commercial applications such as hotels, airports, restaurants and cafes, salons, office cubicles and college dorm rooms. Smart chip recognizes and optimizes the charging requirements of individual devices. USB ports are positioned vertically providing more space for maneuvering and reducing stress on USB cables. Fits in a standard wall box, is compatible with standard wall plates and can be multi-ganged with other devices. 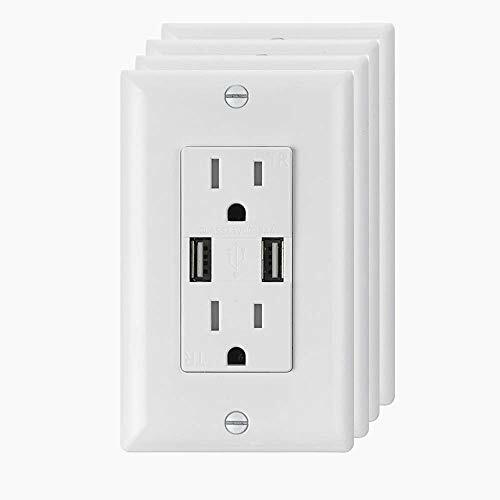 Easy to install, can replace existing outlets. - Kindle , Nook e-reader - iPhone - iPad - iPod - GPS - Galaxy Tab - Bluetooth Headsets and other USB compatible products. Smart chip recognizes and optimizes the charging requirements of individual devices,provide the fastest charge to iPhone, iPad, iPad Air, and other smartphones, tablets, and USB devices. UL listed, Back and side wired for easy installation. Includes a normal wall plate and a screw less wall plate for decreased tampering and increased safety,can replace existing outlets. Child safe, tamper-resistant duplex receptacle increases safety by preventing unwanted objects from being inserted into the outlets; complies with 2011 NEC Code. We provide 1 year warranty for this outlet, please email us for any query and we will be in touch within 24 hours. Replacement or refund will be provided for your preference. If you have any questions about this product by ECOELER, contact us by completing and submitting the form below. If you are looking for a specif part number, please include it with your message.